Bankruptcy is the end result. And don’t believe the old saw about how governments can’t go bust. They can, and they do by destroying their currencies, as von Mises implied in the quote above. The naïve inflationists referred to by Mises justify their stance by believing that inflation is invigorating, and deflation is devastating. 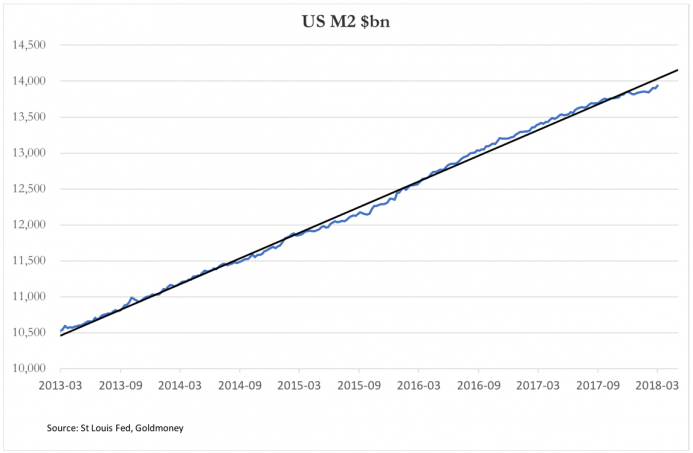 Any and all statistics pointing to a slowdown in the growth of money supply or in the economy is therefore taken to be a forewarning of deflation. We must discriminate between the momentary problems faced by central banks and the inevitable crisis at the end of the credit cycle. Dealing with problems as they arise has become routine, the justification for continual inflationism. The credit crisis is a different matter. Central bankers do not seem to realize it, but the credit crisis is their own creation, the way markets eventually unwind the distortions created by earlier monetary policy. So long as central banks suppress interest rates and expand money and credit, there will be periodic credit crises to follow. The concluding phase of credit expansion before the credit crisis is now about to begin. Demand will appear to be picking up while prices are rising and interest rates still low. It will be characterized by a growing belief among businessmen that they must borrow to invest. We can already anticipate the factors leading up to this happy but brief state. America is not alone in its stimulation of markets. Interest rates are also suppressed in the Eurozone, Japan, Britain and Switzerland, all of which stand to benefit from China’s economic evolution. Those economists who in recent weeks have proclaimed that at last synchronized growth is here do not realize that the inflationary consequences for prices brings the global credit crisis forward in time. GOLD is the only true money.